obliterating some small road side village. slide forward till your knees are up against the seat in front of you. really start to get a feel for the road, and not in a good way. are human either) was being pleasantly humidified into the air. Lastly, imagine this journey taking four hours. were walking along side the train. conversation with one of you?" front of so many, would it be ok to speak with one person?" Yesterday Frank (another volunteer) and I met Bebeth at the POSTA. There is an askari there, called Henry that has been very friendly with us. meet him later today so we could have a "conversation". to meet him at five after the POSTA closed. communication with me. Of course I'm thinking, "Uh why?" 45 minutes. I found out that he is a pastor at a small Pentecostal church. He told me he lived on his father's compound with several other brothers. him, but had lost contact with them. Where are these guys? Seattle or rural Western Kenya ? At the end of my walk on Wednesday morning I met a very interesting man. His family runs a hospital in the area, he has some fish ponds and his family also owns a 30 acre forest nearby. He said that it was 2km away. We made plans to meet again at 7:30 on Friday morning to walk to the forest. When we left the house on Friday we figured we’d be gone about 2 hours….we should have known better. As we set out Kevin told us that it was 5km, not 2km. That still wasn’t too far. So we headed down a dirt road that went behind our house. Very quickly you felt like you were no longer in a large town. It was quiet, the houses didn’t have electricity, and the people just seemed different. We were back to the world where people were surprised to see wazungu. As we walked Kevin quizzed us on the Swahili we knew and taught us new words. As we got farther into the bush Kevin seemed to know more and more people. When we asked him why he told us that we were getting to his ancestors land, which meant that everyone around was somehow related to him. Various family members would come out and walk with us for a bit and then head back home. Kevin was so friendly and helpful. Most people spoke a combination of English and Swahili, but those who could only speak Bokusu (the local tribal language) Kevin would translate for. After around 1.5 hours we arrived at the forest. One of the important aspects about his forest was that it was a forest made up of indigenous plants and trees. Which is rare as most land has been cleared for farming or been cleared and then planted with eucalyptus trees? His family really wants to turn it into a park that people can come for picnics, camping, walking and experience/see the old indigenous ways, a sort of Kenyan Plymouth Rock. They have already started putting up signs and have built a few buildings. 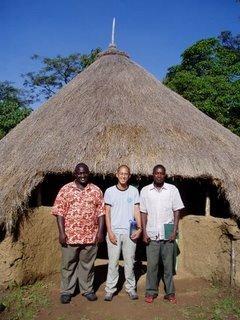 In the first picture you can see (L-R) Kevin, Mark and Patrick (the caretaker of the forest and Kevin’s cousin) standing in front of the welcoming hut. Patrick took us all on a walk through the forest. They say that there aren’t too many animals b/c most of them have been scared off by the people. (Although Kevin did tell us there were monkeys in the area that could be seen in the early morning.) They have been trying to get grants from the government to do more improvements, including putting a fence around the forest to keep the animals in, but as of yet they have been unable to secure funding. After walking for awhile we came to the herbal clinic/nursery. There they grow plants/trees to make herbal medicines out of and have a clinic with an herbalist. We saw rows and rows of small trees all with purported medicinal healing properties. They took us through the workshops where they clean, dry, and prepare the medicines. There was around 30 – 40 drying racks for different herbalists. Every Wednesday herbalists from all over the area come to trade recipes and techniques. After leaving the forest we headed back to Kevin’s family’s house. There we met his 72 year old grandmother. We spent about an hour resting there. We talked about how many children she has and where they all are. One of her daughters went to the US to study at Champaign, IL and is still living there. This woman lives an hour walk from town with no electricity, and yet she still communicates with the daughter via emails (which another daughter delivers). Technology is amazing sometimes. We left her house and proceeded to the great grandmother’s house. She was 101! She spoke no Swahili, so everything had to be translated. It was a bit confusing, but very cool none-the-less. After sitting with her for awhile (she was sitting on the ground and didn’t look like she could walk,) Kevin told her she was being rude and she should get up and show us that she could walk. Given that we couldn’t speak her language it was hard to argue. So she got up and came outside to take a picture with us. In the picture she doesn’t look nearly as old as she did in real life. She was pretty much blind, but she told us that she knew we were wazungu because our hands were so soft! Before she left she gave us 6 eggs in thanks for visiting her! Finally we started the long trek home. At this point it was 2pm, we hadn’t eaten anything, and I was completely out of energy. Kevin tried to teach us some Bokusu on the way back, but I barely had enough energy left to put one foot in front of the other. We finally arrived home at 3pm. It was totally exhausting, but well worth it. We got to see a beautiful forest, see an herbal clinic, and meet some new and interesting people. We’ve got days and days in front of us to rest! Not being able to speak and understand the nuances of the language and culture often make it difficult to get reliable information in Kenya. This requires that you often ask the same question multiple times to multiple people. For example when you go into a store and ask if they have an item, if a Kenyan doesn’t know, they never say “I don’t know” they say “No we don’t have.” So if you think they really do have it, it pays to ask again, or find someone else to ask or come back later. Anyway, so Bebeth and I are walking back from dropping a couple of friends off at the EZ coach stage. Knowing that the POSTA (Post Office) closes early on Saturdays, we decided to walk up and ask Henry, the askari (think rent-a-cop), what time the POSTA opens and closes. Bebeth: What time does the POSTA open? Henry: It opens at 9. Bebeth: What time does it close today? Henry: It closes sharply at six. Henry: Yes it closes sharply at six. Bebeth: But on the weekdays it closes at six. Doesn’t the POSTA close early on Saturday? Henry: Yes it closes today at six. Bebeth: (Silent for a moment.) Ahhh you mean saa siita (6 o’oclock)? Henry: Ahh yes pole (sorry) saa siita (6 o’clock). So after reading that you are wondering, what is the difference between saa siita (6 o’clock) and 6 o’clock. Kenyan’s have two different times that they keep. One is just like ours, whatever time it says on your watch and then there is Swahili time. Swahili time starts at 7 am, which is saa moja (1 o’clock). So to figure it out, you just subtract six from your watch and then say it in Swahili. So when Henry said saa siita (6 o’clock), we needed to translate that to noon our time. Anyway one of those funny cross cultural experiences. We decided to decorate our blog a little and uploaded some pictures. If you go to http://www.steudel.org/blog and log in you can see the pictures we posted at the top and along the side. In some browsers if you hover your mouse over the picture a little cpation will show up giving a short description of the picture. For those of you who don’t know, your job in Peace Corps is nothing like a job at home….especially in the beginning. As you know we are “attached” to the NGO Pride Africa. 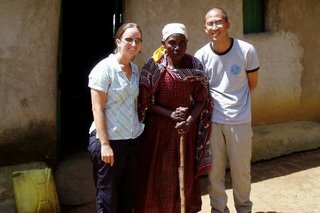 This means that it will be our primary job in the beginning, although as time goes on we are supposed to find “secondary projects.” Peace Corps tells these organizations that they are not supposed to expect/require much of us for the first three months. During this time we are supposed to get oriented to our new community, set up house, etc. Being Americans, however, we are ready and wanting to do work as of day 2! Fortunately yesterday and today (Monday and Tuesday) we actually got some real work to do. Our organization is looking for more farmer groups to work with. There is an organization here called Farmer Field Schools (originally started somewhere in Asia) that has thousands are farmers in organized groups. Kenya’s FFS program sets the standard around the world. Our NGO had a meeting with FFS yesterday to explore the possibility of working together. 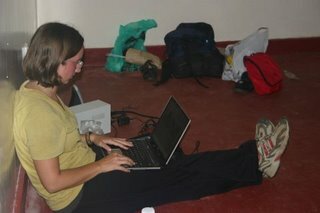 There were 4 people from the Nairobi office plus the two of us. We went to the nearby town of Kakamega (about an hour away) and met with the head of FFS and then with 4 of the farmer leaders. At both meetings there was a lot of excitement about working together. If we can get Drumnet to work with this first group, the speed and potential growth of working with FFS could be amazing. In the coming months both of us will probably be going to the smaller meetings to explain the project to the individual farmer groups. This morning I got up early and took a Matatu to a nearby town to meet the Pride Africa group for another outing (Mark was tracking down a cable he needed to work on the Drumnet video.) We were headed into the country to meet with a farmer who is our main contact with the current group of sunflower growers. We needed to get concrete data on how many seed had been sold, how many acres were planted, how many loans has been made, etc. Unfortunately this farmer is playing hard-to-get, so to speak. After many phone calls he finally agreed to meet us at his duka (tiny store.) So we got in the car and started the 1 hour drive. About 45 minutes into it he told us to go to his house instead. So we arrived at his house and his wife told us that he wasn’t there, but he had left the info with her. When we took a look at the books there were small bits of information, but certainly not everything that we needed. After much discussions Jonathon got on the phone to the farmer and tried to explain that we really needed more information and we needed to meet in person. Unfortunately mid-sentence the call ended. Now in Kenya that could mean many things…a) the network dropped the call, b) the farmer ran out of power, or c) the farmer hung up on him. Unfortunately option C is most likely since when Jonathon called back he got a message saying the call was blocked. We were not a happy group driving back to the main road. It looks like the meeting with FFS came at just the right moment since we may not be able to work with this farmer any more. reading.) We’ll try and get a good description of what Drumnet is exactly sometime this week since I know many people have been asking us about that. So, everyone asks what we’ve been doing now that we’re actually at site. we’re doing here, and too often asking us if we have money. our laptop. For now, its great. myself that its ONLY been 7 days. It appears that sometimes people are having trouble logging into our blog to see the pictures. We are working on fixing this, however, we have been unable to get the error message. If any of you happen to have that happen again could you please email us the *exact* error message? In the mean time, if you close your browser and then try again, it usually seems to work. The first picture is a picture of Bebeth the very first night at our apartment. The only things that are in this apartment are our clothes and items that we brought from America. (Oh and a full extra duffel of Peace Corps manuals). Here she is checking email and writing up the “we’ve arrived” post. So you are probably like, “Checking email?” how are they doing that. Wireless technology is pretty amazing. In Kenya and probably all of East Africa cell phones have been growing at an exponential rate. In the last five years cell phone subscribers have grown from hundreds of thousands to over 6 million subscribers. In Kenya there are two major cellular providers, Safaricom and Celltel. The government currently has started to de-regulate the communications industry tentatively releasing its monopoly. A third provider, I believe eco-net, is trying to make inroads into the industry. So you are probably wondering why I’m showing a cell phone and a blinky thing that looks like a flash drive. Well this is how we connect to the internet on our laptops almost anywhere in Kenya. The cell phone, a Motorola L6, about 7,900 shillings ($100 US) in Nairobi, can be connected to your laptop with a USB cable. You use it just like a old dial-up modem. It gives you around the same speed. The blinky flash drive is actually a high speed cellular modem. It’s cost is about 15,000 shillings ( $200 US). Our company that we are working for purchased it for us. They are currently paying 2500 ($34 US) shillings a month for 300 mb of data, after that it costs us 10 shillings (13 cents) a megabyte. Only certain urban areas provide the higher speed connection, fortunately we happen to be in one. Another interesting thing about cell phones is that most people are on plans called “pre-paid”. Which means you go to the little dukas (Swahili for shop) or supermarket and you buy scratch cards in various denominations: 50, 100, 250, 500, etc. The back of these scratch cards are just like lottery scratch cards in the US. You scratch off a section on the back and you reveal a long 11 digit number which you then enter into your phone. You hit send and it adds the amount to the balance on your phone. When you call or SMS it deducts an appropriate amount off your balance until you run out. You can send a special code on your phone that will display the balance at any time. So the first night in our apartment we slept inside our tent. Here’s a picture of it. We left our Thermarests in Seattle, so we ended sleeping on the concrete floor in our sleeping bags. None of the windows have curtains so we hung Bebeth’s laasos up over the windows to give us some privacy. (Laasos are large squares of fabric that women of certain Kenyan tribes wrap around themselves to keep their dresses clean) After the bumpy and tiring bus ride, we actually slept pretty well. The next day we asked the local caretaker, Halad Ali Murunga, about furniture. He helped us secure our first piece of furniture, a bed. In two days the fundis (Swahili for carpenter, repair men, almost anyone that builds things) custom built a simple 4ft x 6ft bed for about 2300 shillings ($23 US). In the US you couldn’t buy enough raw wood for half the bed at that price, and the wood is pretty good quality. The next picture is a picture of our “gas cooker”. It is a 6 kg container of gas, what kind I’m not sure. We bought a simple burner and grill plate that sits on top of it. If we find that it is too slow to cook with just one burner we may spring for a two burner gas cooker that we can attach to the container. This should probably last us about two or three months especially since we’ll be using a water filter instead of boiling all of our drinking water. Well that’s all for now, I hope all is well, till next time.